Carl Froch knocked George Groves out with a huge right hand in the eighth round of their rematch, in front of a British-record 80,000 fans at Wembley Stadium. In doing so, Nottingham's Froch retained his IBF and WBA super-middleweight titles and erased the controversy of their first encounter. Froch, 36, won in Manchester last November via a controversial ninth-round stoppage - but there was no room for debate this time. Having built a lead in an often cagey fight, Froch floored the challenger towards the end of the eighth, rendering Groves unconscious. Referee Charlie Fitch started his count but soon called it off. And while Groves initially protested, there were no further complaints. 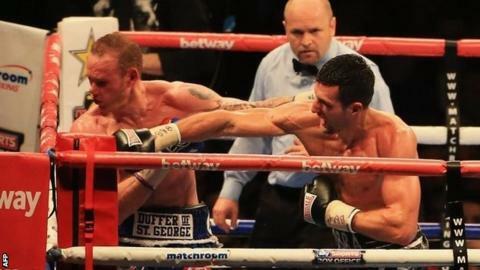 Two judges had Froch ahead at the time of the stoppage, one Groves. Froch, taking part in his 12th straight world title fight, could now face former Olympic champion James DeGale in another huge domestic dust-up. DeGale put in a fine performance on the undercard, demolishing American Brandon Gonzales in four rounds in a final IBF eliminator. Groves entered the stadium atop a double-decker London bus and appeared totally unfazed by the heaving throng that greeted him. The champion, looking the tenser of the two, arrived by more conventional means. The first round was a cagey affair, with both men reluctant to engage, but the challenger probably nicked it courtesy of some sharp jabs. Froch promised to box more correctly than he did in the first fight, and there was evidence of that in the early rounds, the champion employing his jab to keep Groves at range. Londoner Groves, 26, was shoved to the floor midway through the second but he did throw Froch off balance with a snappy left-right combination. However, it was already clear that the return bout was destined to be far more cautious than the first, as is often the case with rematches. Frustrated by the lack of action, the crowd started to boo a minute into the third, which spurred both men into action. In one meaty exchange, Groves landed with a big right hand, only for Froch to hit back with a big left. Groves had more success with his right early in the fourth and Froch was stunned by a concussive combination midway through the round. But with Groves wanting to remain sharp down the stretch, he was reluctant to overload his attacks. "It was one of the great knockout punches of all time." The fight, which had burned slowly for the first third, opened up in the fifth, Groves peppering Froch with more right hands and Froch getting the better of some muscular inside exchanges, opening up a cut under his rival's left eye. Round six was more measured but Froch won it, taking advantage of an unusually small ring, hunting Groves down and drilling him into the ropes, although he did have to take some more chopping rights up close. Before the fight, Groves vowed to knock Froch out with a left hook, and he landed with a beauty early in the seventh, although Froch probably stole the round again with some rugged work late on, including a clunking right. "Groves did not move for two or three seconds when he went down and the referee called it off. Carl was looking for a single punch finish. I tipped Carl but I did not think there was any chance of a knock down like that. Under no circumstances." And it was all over two minutes and 34 seconds into the eighth, Froch flooring Groves with an enormous right cross as the challenger looked to get a shot off. Froch has now won 33 of his 35 professional fights, with two defeats, while Groves slips to 19 wins and two defeats in the paid ranks. Another option for Froch is American Andre Ward, who beat the Englishman in 2011. But DeGale is likely to be first, followed by a rematch against Ward in Las Vegas next year, which would probably be his last fight. Saturday's bill was the first at the new Wembley Stadium since it opened in 2007, and the attendance set a new post-World War II record for a boxing event in Britain. The last fight at the old Wembley Stadium took place in 1995, when Frank Bruno beat Oliver McCall to win the WBC heavyweight title.